In the late ‘60s, The Man From U.N.C.L.E., Mission Impossible, I Spy, and The Wild Wild West, among many others, were riding the crest of the James Bond superspy explosion on American television. Across the pond, spies were also dominating the broadcast channels. Entertainment espionage, however, was very different on either side of the Atlantic. While 007 was most definitely the quintessential British spy, it was the American spy shows that followed his lead more closely. On American TV, espionage was fun—cool gadgets, maniacal villains with henchmen and hidden lairs, beautiful women, and suave, karate chopping, heroes with blindingly white teeth. On the other side of the pond things were different. In British spy shows, espionage was business—a deadly business. Gritty, harsh, morally ambiguous, dour, and most of all, cynical, British TV spies in the ‘60s were the antithesis of Bond. It was as if Bond was a drunken relative at a party—entertaining, but embarrassing—and much must be done to regain a stiff upper lip façade. 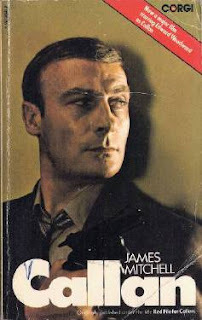 Over the next few columns, I plan to look at the best of the British television spies and the tie-in novels connected to them. First up is the quintessential British spy series, Callan. 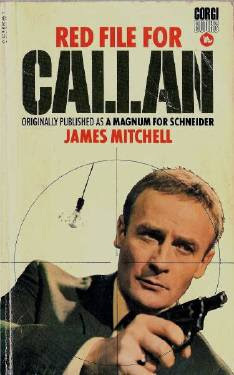 In the 1967 British television drama A Magnum for Schneider, the terse talking, totally pitiless secret agent David Callan became an instant touchstone of British espionage. A hugely successful television series quickly followed—running from 1967 to 1972. 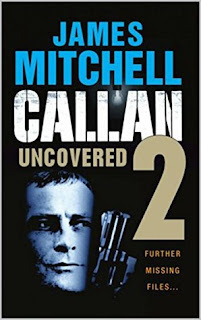 Callan works for a shadowy governmental agency known as the Section, which deals with internal security threats to the United Kingdom. Using it’s carte blanche mandate, the Section is ruthless in its methods. Torture is the preferred method of interrogation, and targets sanctioned for possible assassination are so routine they come in color coded files. If the file is red, the individual inside will soon be dead. No espionage agency connected to the Western world (the supposed good guys) has ever been portrayed in such a sinister manner. Executioner, bodyguard, stone killer, Callan is a blunt instrument wielded by Hunter, his always despised and eventually hated agency control. 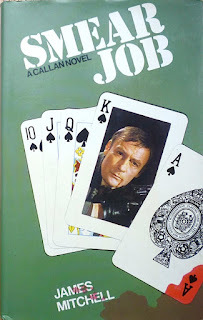 Created by author James Mitchell, and portrayed with callous world-weariness by actor Edward Woodward, Callan became an iconic anti-Bond—a man doing a blue collar job he often regrets, but keeps doing because it is the only thing he knows how to do—and he’s very, very good at it. It says something when a coldly calculating human stiletto is seen as a hero because he is the least morally ambiguous character in the series. Callan is a man without friends. A malodorous thief, known only as Lonely, is his only acquaintance—a man whom he constantly threatens and abuses. Theirs is a classic love hate relationship maintained by fear, cash, blackmail, and mutual need. Yet there remains a tight bond between the two men. They may hate each other, but they hate others more. They are two islands connected by a frayed and splintered wooden rope bridge. Before he began to write extensively for television, Callan creator James Mitchell started his writing career as a novelist. 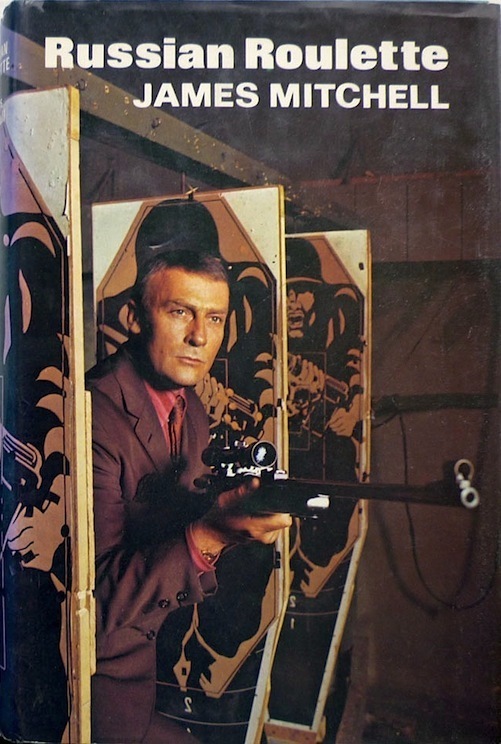 In the ‘60s, after several novels written under different pen names, Mitchell began a successful series of espionage novels featuring gunrunner-turned-secret agent John Craig, which he wrote using the pseudonym James Munro. 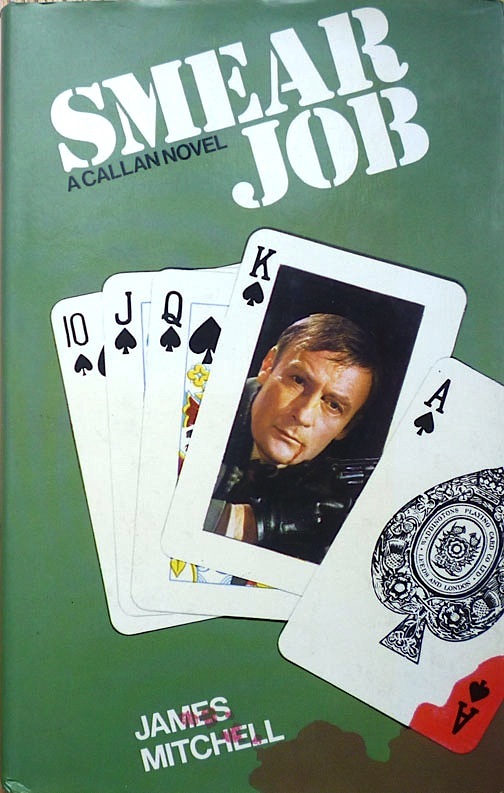 When Callan became a British television sensation, it was a natural segue for Mitchell to write a series of books based on the character. 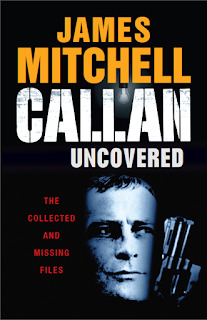 Published under his own name, Mitchell based the first novel, A Magnum For Schneider—aka: A Red File For Callan in the USA, and later simply Callan when it was reissued to tie-in with the Callan movie release—on the original television drama. Callan is washed up. The most efficient killer in Europe is working as a book-keeper for a small, dusty merchant. But circumstances force his old boss Hunter to employ him for one last operation—eliminate a man named Schneider. A cheerful, friendly, affluent man, Schneider and Callan have a shared passion for model soldiers used in battle recreations. The operation is studded with lethal booby-traps, but Callan's own inhibitions become the most dangerous. 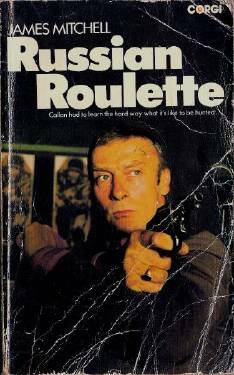 By the time the second Callen novel, Russian Roulette, was originally published the Callan TV series had effectively ended. However, the character continued to have a strong following. Russian Roulette is an original novel, not tied to any television episode. It recognizes Callan for what he is—the best killer the British have ever had. His skills are inherent in his survival instincts, his stalking animal patience, and his ability to destroy without hesitation. The KGB want Callan badly enough to ante up the top British spy held captive in the Kremlin in exchange for his corpse. The British agree. Abandoned and alone in the alleys, squares, and parks of London, unarmed and half-blind, Callan becomes fair prey for three deadly Russian KGB agents with a grudge. But Callan is still the best killer the British have, and even without a gun, he is a walking bloody arsenal. 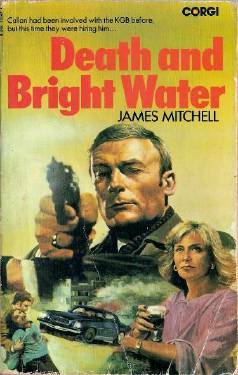 In Death And Bright Water, Callan finds retirement is not easy for a man of his background. He believes his days with the Section are over. He'd had enough and walked away. But a man like Callan can never escape killing and violence. When the mysterious Dr. Blythe appears with a proposition, Callan can’t refuse. It is a simple kidnapping job—getting the beautiful Sophie Kollonaki's daughter out of Crete. But on the way to the Greek island, Callan and the faithful Lonely begin to suspect Sophie is involved with the KGB—and where the KGB lurk, death is never far away. S mear Job begins with Hunter needing two little favors from Callan. Stealing a book from a library sounds easy, except the library is in Sicily. But making sure Gunther Lesir loses a fortune at cards is a bit more of a problem, especially as Callan is no card sharp. Neither of the favors, however, are as big a problem as Callan’s knowledge of Hunter—there would be something more, something nasty. When the twist comes, Callan finds himself on an excursion to Mexico into the dirtiest businesses in the world—drugs, prostitution, blackmail, and death. 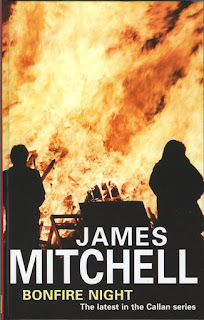 The last Callan novel, Bonfire Night, would not appear until a number of years after Smear Job. The world has changed...Callan is rich, living in luxury in his own personal castle in Spain and in danger of falling in love. His old partner-in-crime, Lonely, is even richer—now a computer genius and businessman going straight (more or less) under the name Roger Bullivant. The new Head of Section, codename Hunter, is a woman, but the Section no longer has a hold over Callan. Then Voss, the ex-Stasi sadist who tortured Callan in East Berlin, surfaces long enough to make an attempt on Callan’s life—endangering those to whom Callen has become close. Blood and death follow as Callan rages from London to the south of Spain, ready to bring down his own form of retribution. 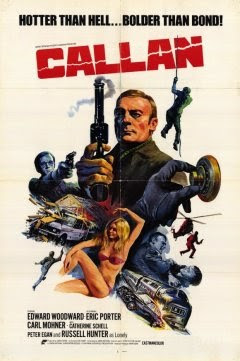 The cult following for Callan, fed by Mitchell’s novels, was strong enough for a 1974 feature film, simply titled Callan, to be produced. 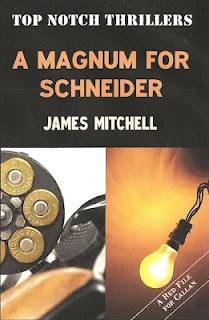 Following the same story presented in A Magnum for Schneider, Callan has been forced into retirement after appearing to lose his nerve. However, he is called back into service to handle the assassination of Schneider, a German businessman. His former boss, Hunter, promises Callan he'll be returned to active status if he follows orders—something Callan desperately wants as without the work, he has nothung other than staring into the void. However, as always, Callan refuses to act until he knows why Schneider has been marked for death. Worth watching for Callan completists. 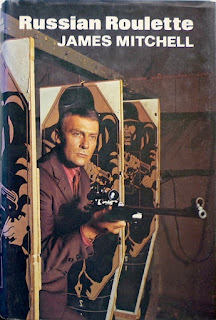 For all Callan fans, however, there remains a special treat. James Mitchell also wrote (at least) forty short stories featuring Callan, Lonely, and the regular members of the Section. These were originally published in Britain’s Sunday Express and syndicated in newspapers in Singapore and Australia. 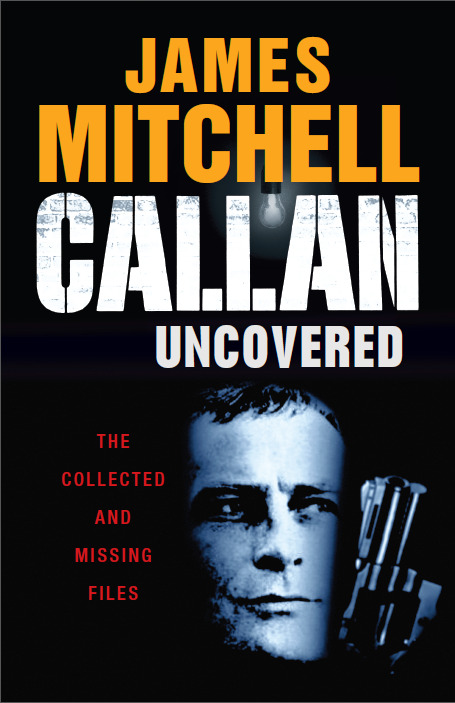 In 2014, author and Callan expert, Mike Ripley, did a vast amount of research to gather these stories together in two volumes—Callan Uncovered and Callan Uncovered 2. In my opinion, these collections are not to be missed. Their terse, stripped down, prose match Callan’s personality perfectly. The novels are very good entrées, but for a true taste of Callan, the short stories are a feast.